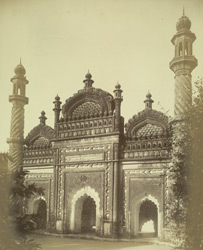 Photograph of the facade of the Ali Masjid at Rampur in Uttar Pradesh, taken by an unknown photographer in c. 1911, from the Nawab of Rampur's presentation album. This is an album of photographs of Rampur that was presented to the India Office by the Festival of Empire in November 1911. The Nawab of Rampur, Hamid Ali Khan (1896-1930), was one of the exhibitors at the Festival of Empire exhibition, held at Crystal Palace to mark George V's coronation.